Love the color and pattern of the flowers. Also love that it is light weight for easy laundering! Makes my bedroom look so fresh and new! Website pictures matched my expectations. A garden-inspired design perfect for the master suite or guest room, this lovely quilt set features a vibrant floral motif. Refresh your bedroom decor with the Floral Flourish collection. You can bring floral fancy right in the master suite or guest room with this eye-catching quilt set. This is a beautiful quilt set. The pictures don't do it justice. The colors are lovely and the contrasting pattern on the back adds a whimsical flair. The overall effect is elegant and fresh. The quilt is large enough to function as a bedspread. Looks nice. 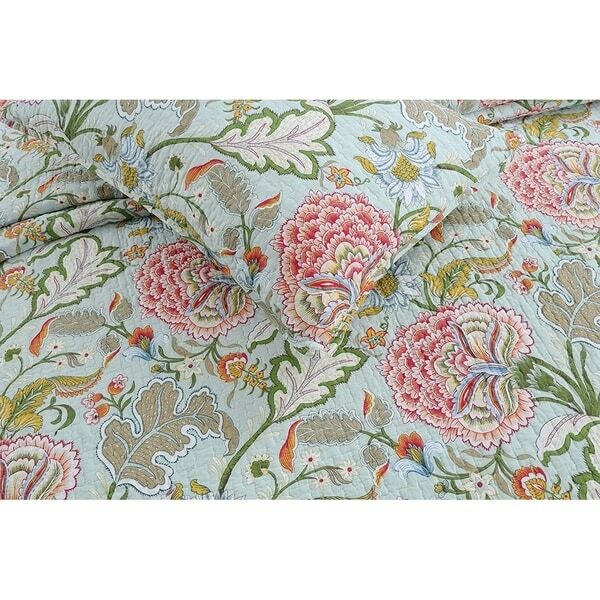 It is light vibrant quilted cotton. A pleasant feeling when walking into the room. I use a lot of bed pillows so it’s tricky to hide behind the pillow shams. I stack a few more decorative pillows behind and on top. I am so happy with my new quilt. The quality is very good and the colors are true to the photos. The delivery was right on time too! Thank you, Overstock! This is such an artistic, delicately colored quilt. Hard to believe something so beautiful will be so easy to clean! This is a really pretty set, and the quality is excellent. I am very happy with it and will definitely remember this brand for additional or future purchases. I couldn't wait for this to arrive. It was my Valentine's Day gift to myself. The colors are mostly as I expected - the reds a little more red than pink and the blue more blue than purple. THat said - it looks beautiful with my decor, is light and makes a gorgeous statement. I like the pattern and the colors, which are vibrant and true. I’d definitely recommend it! Beautiful pattern and colors. Very minty. Nicely made. Love the print and color, it is a little thin. "What does the reverse side look like?" It's 100% cotton, beautiful, and the perfect colors for my bedroom.